And other times, I’ll buy said item because I just can’t help it. I’m talking.. Stevia or salad dressing in a spray bottle. Ok, fine. I cave and buy it, food fad or otherwise. This is what happened with coconut oil. For a while, it was everywhere. Use it in food, use it in the shower, use it to get a kid’s head out from between the bars in an iron fence.. blah.. blah.. blah. Buying it would cost you more than the money you’d spend on medical bills from climbing a coconut tree, picking the coconut, falling from the tree, and fracturing a femur. I found a jar of virgin coconut oil for $5.99. I figured I’d be a sport and try it out. You want to go for the virgin and extra-virgin (unrefined) kinds of coconut oil. Otherwise, chemicals and high heat may’ve been used in the creation process. The first thing I noticed was the scent. I love coconut. So this put my nose (and stomach) in a happy place. It’s tropical, sweet, and nutty. Second thing I noticed was that the oil is hard. It’s almost like what you’d get when you fry chicken, let the oil cool, and throw it in the freezer to make clean-up easier. My grandmother always did that. Don’t look at me funny. It’s thick, kind of like Crisco. But it has a texture to it. It’s somewhat grainy. Coconut oil is loaded with saturated fat, which is typically pegged as bad for you. One tablespoon has 12 g, versus 1.9 in olive oil, and 7 in butter. But here’s the deal. If you get the good stuff (unrefined. Virgin/extra-virgin), you’re dealing with natural oil, which wasn’t hydrogenated (hydrogen is added to keep it from spoiling). So that’s a good thing. It’ll also last about two years without spoiling. That’s rare for an oil that doesn’t have a few tricks up its slick sleeve. You don’t have to refrigerate it. If you do, that’s fine. It’ll stay solid. If you keep it in the pantry or on the counter, it may turn to liquid if the space is warm enough. Either way, you’re good to go. Most experts say this stuff is good for you, and even suggest having about three tablespoons a day. 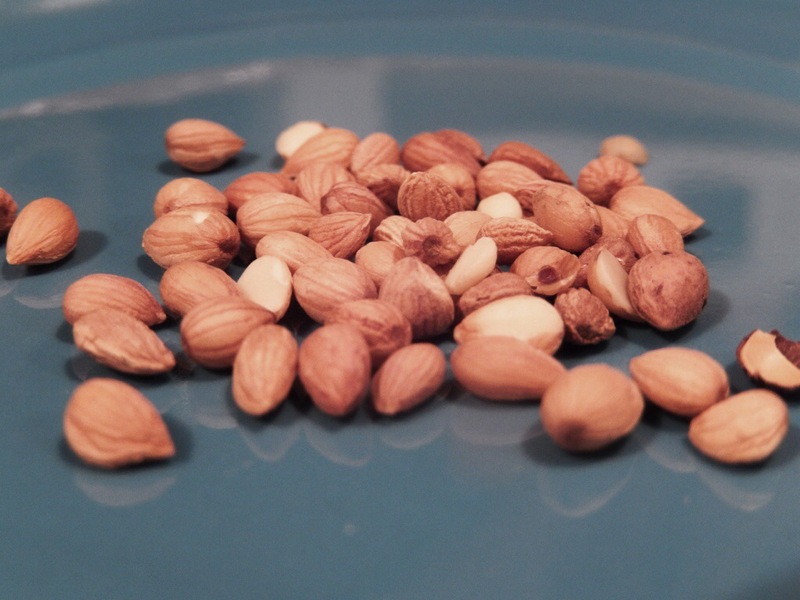 It’s said to boost energy and metabolism, provide antioxidants, and possibly regulate the thyroid and blood sugar. What makes it great, in my opinion, is its high smoke point. That means you can get it nice and hot for searing or frying and not worry about it scorching (like olive oil or butter). If you bake with it, use it in a 1:1 substitution for butter or vegetable oil. So, one cup butter/vegetable oil = one cup coconut oil. If you’re subbing for vegetable oil, you’d want the coconut oil in liquid form. So just warm it till it melts and let it cool slightly. 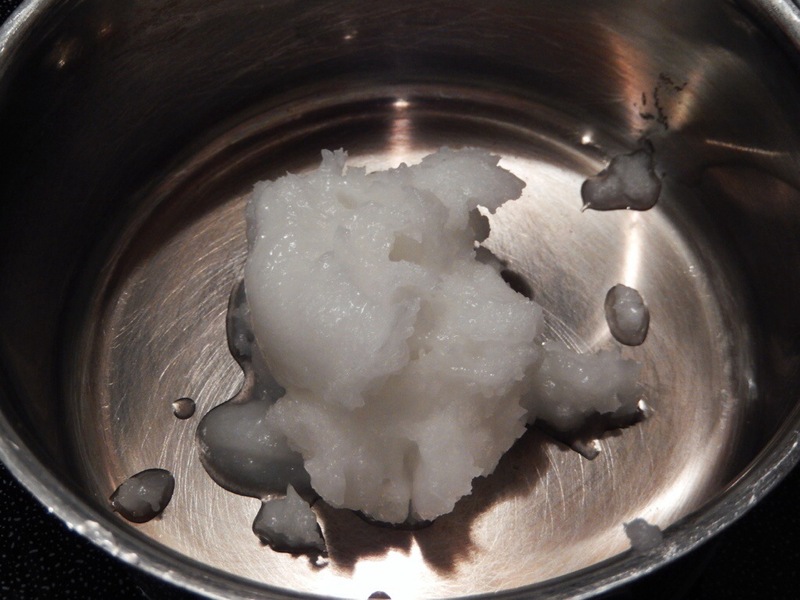 One cup solid coconut oil should equal about one cup melted coconut oil. I used the coconut oil four ways. 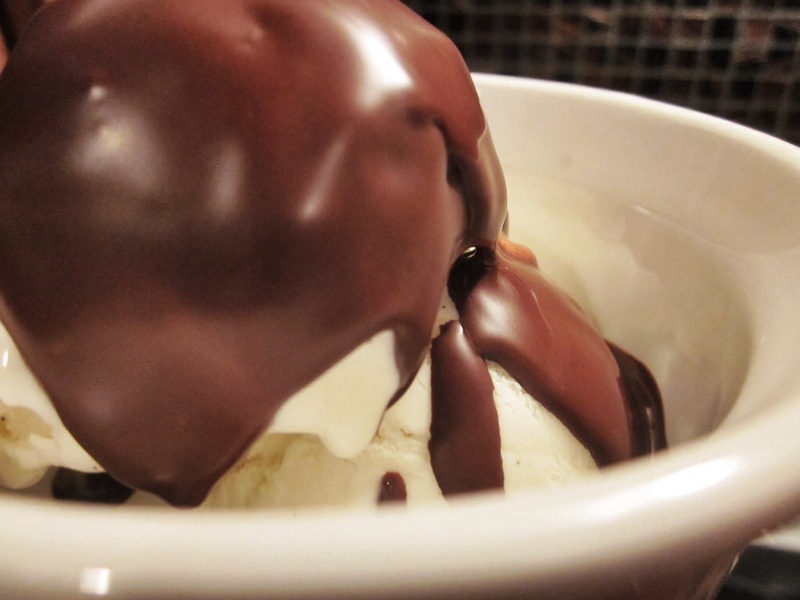 First, I made one of my favorite ice cream toppings: the magic shell! If you look at the actual “Magic Shell” name brand product, you’ll see coconut oil in the list of ingredients. So, sadly, I can’t take credit for this. To make it my own, I added cinnamon and cayenne pepper. 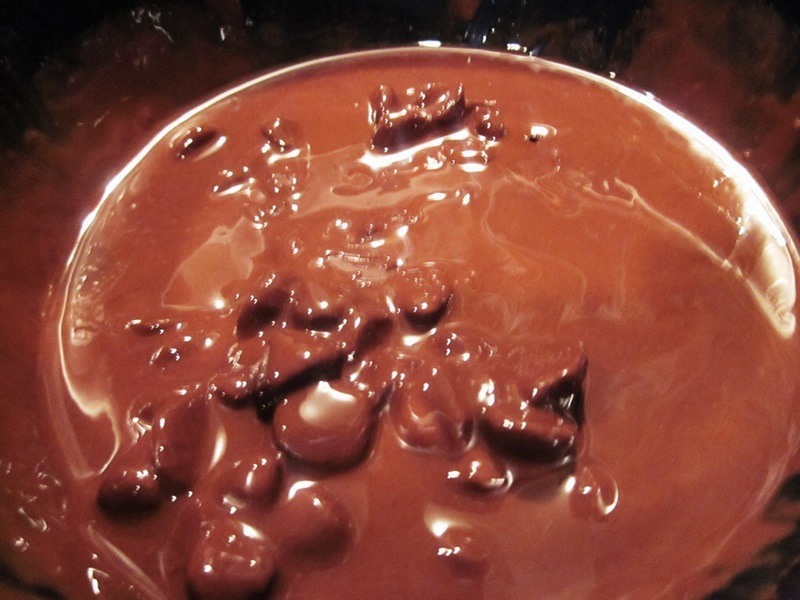 Microwave on the defrost setting until the chocolate is soft enough to stir and combine with the other ingredients. 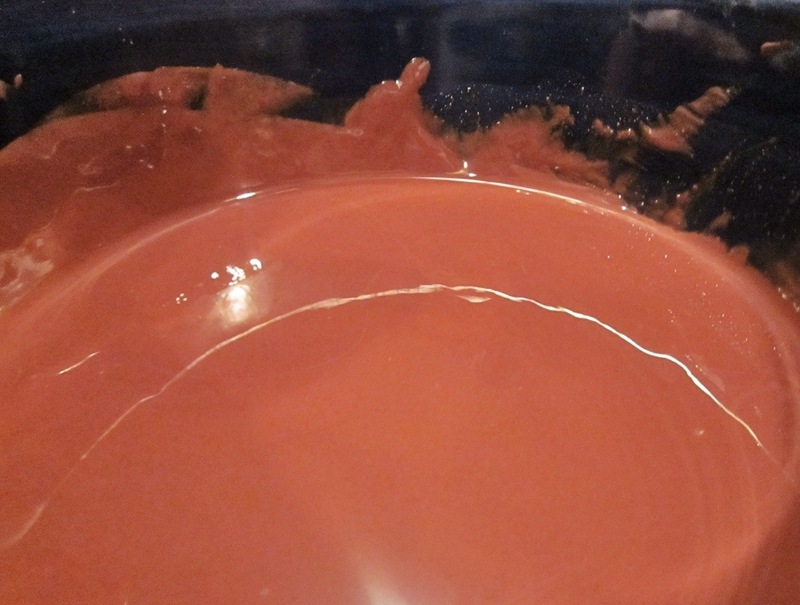 Using the defrost setting helps ensure that you don’t scorch the chocolate. Start with a minute, and stir. Then go for a few more minutes if necessary. If you don’t have a defrost setting, start with 30 seconds, and go for 15 intervals of 15 seconds. 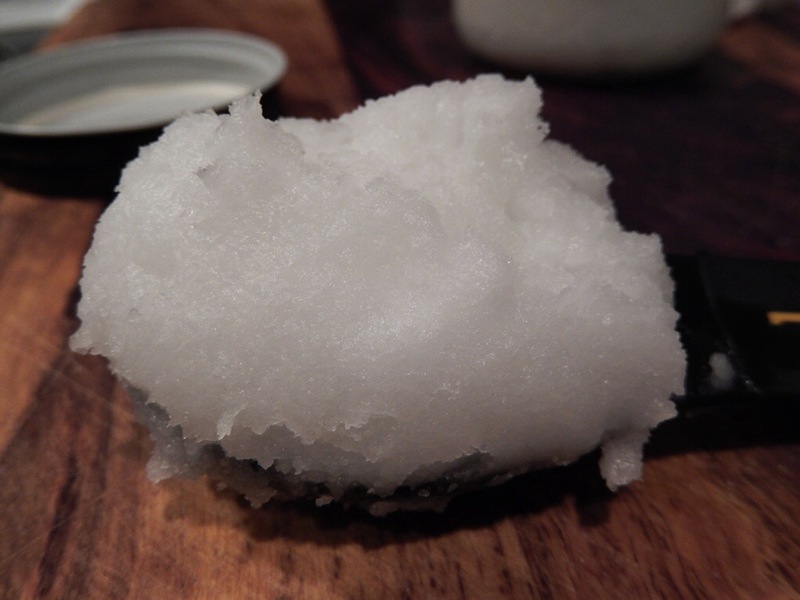 The coconut oil solidifies when it hits the frozen ice cream, and creates the shell. Unlike the name brand product, this version isn’t full of unnecessary ingredients. The cayenne and cinnamon excite your taste buds. For my second use, I fried eggs in it. 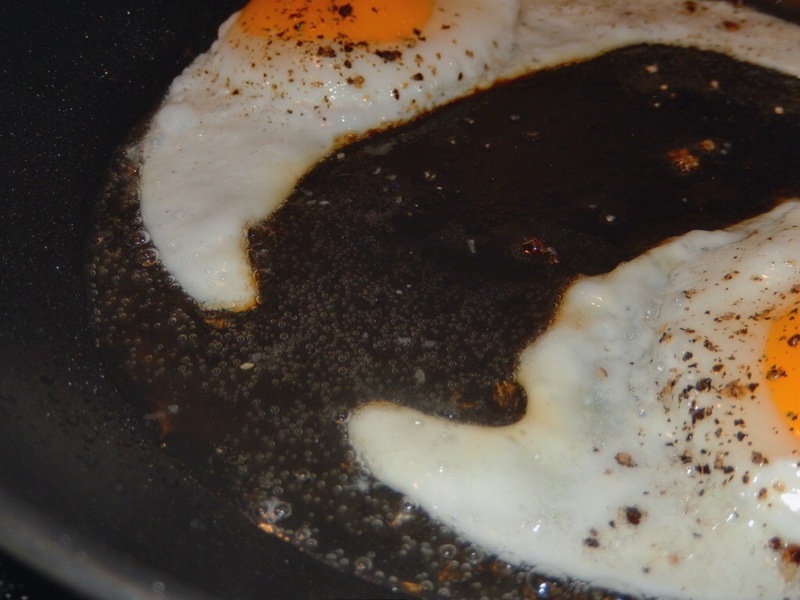 What I loved: The eggs got nice and crispy on the edges, like they do in bacon grease. What I didn’t love: The eggs kinda had a coconut flavor to them. Not all together bad, but not great. For my third use, I made cookies. Two different kinds. The first batch was the awesome no-guilt chocolate chip cookie must-try recipe from Men’s Health that I’ve already told you about. What I loved: The coconut flavor. It was spectacular. When it combined with the dark chocolate, this was Heaven. What I didn’t love: Nothing. This is a winner. I highly recommend baking with this stuff. That is, unless, you don’t think the coconut flavor would pair well with whatever you’re making. But, I mean, how could it not? I’ll tell you about the second batch of cookies in a little bit. The fourth use went to deep frying. Because this brand of coconut oil gave off so much coconut flavor, I wanted to pair it with pineapple. 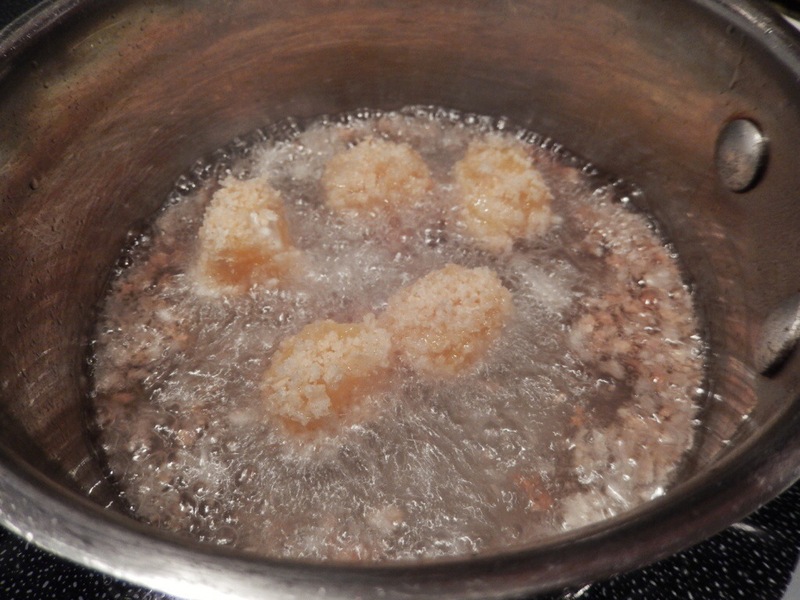 In a bowl, mix the panko, ginger, and 2 good pinches of salt. Stir. Crack the egg in a bowl, and whisk. Put the powdered sugar in another bowl. 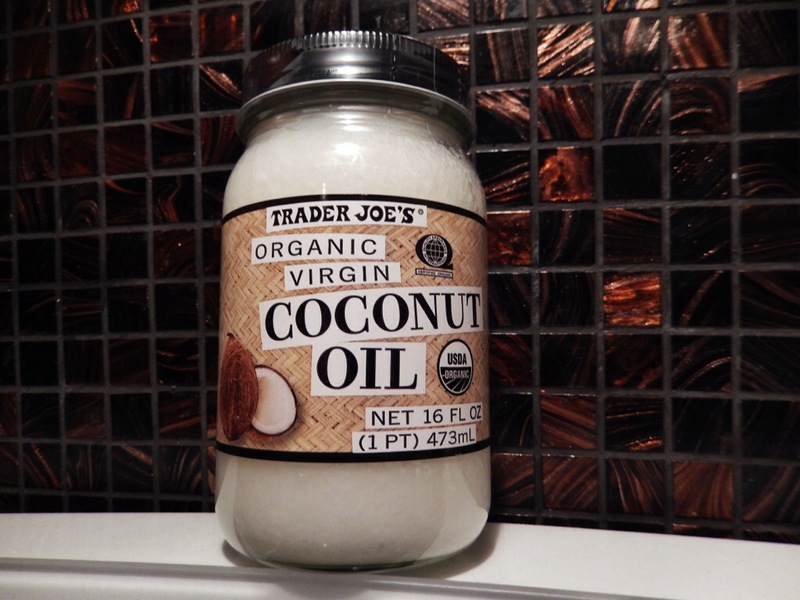 In a medium-sized pot, heat the coconut oil on medium-high. 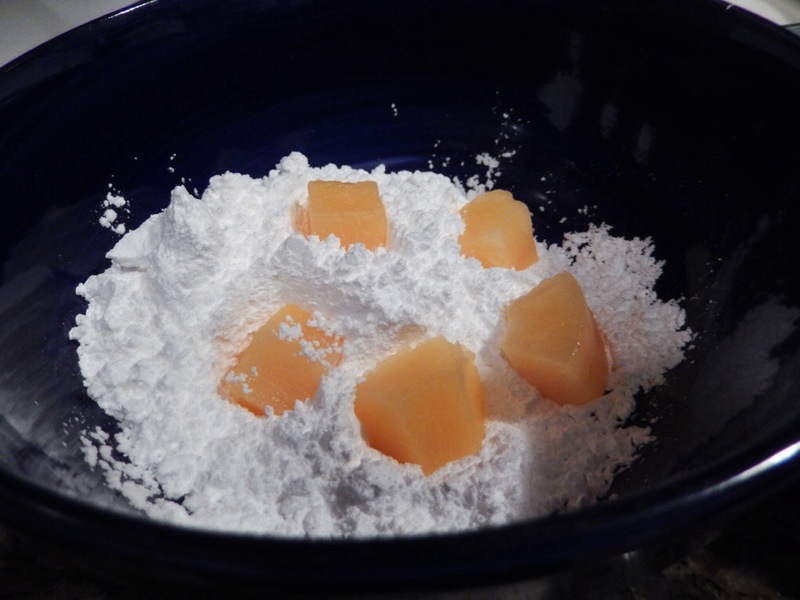 Now, take a few pieces of pineapple and drop them into the powdered sugar. This acts like the flour in a breading process. Coat it well, then drop it in the egg. Fish out each piece and let the excess egg run off. Then, drop into the panko and coat. Drop the coated pineapple pieces into the hot oil. Use a slotted spoon to flip it around, so it browns evenly. Do this in batches, allowing the fried pineapple to drain on paper towels. A few things to keep in mind: This is messy. Your fingers will be coated with everything. The breading may fall of in the oil. Don’t give up, just be gentle. Serve this over vanilla ice cream! What I loved: The crunch on the pineapple. 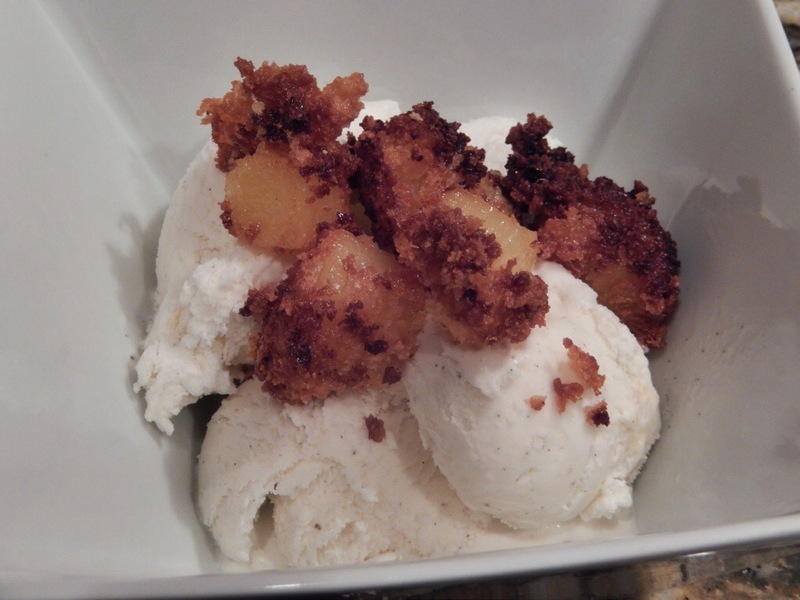 The hot, crispy pineapple paired with the cold ice cream. What I didn’t love: There wasn’t any coconut flavor. I had fun with the coconut oil. Will it replace olive oil and butter in my kitchen? No. I can certainly see myself reaching for it for cookies and cake.. can you imagine using it for coconut or chocolate cake? Yum. Now, to that other batch of cookies. For this, I used another new ingredient. When I was in Florida visiting my family for Christmas, I was at my favorite Italian Market, Mazzaro’s. 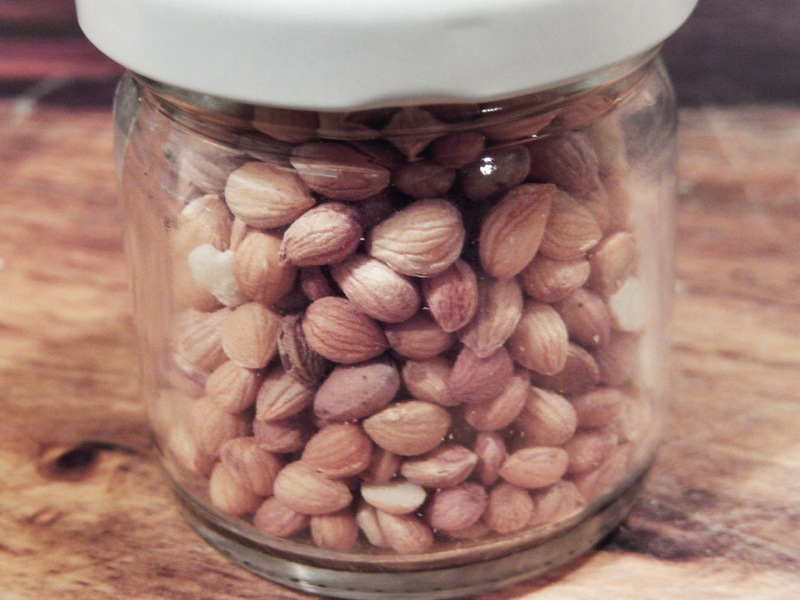 While scouring the shelves and trying to choose just a few things to bring home with me, I saw this tiny jar of what appeared to be nuts or seeds. It had a blue label with “Mahlep” on it. I grabbed my phone and Googled it. Turns out, it’s the seed inside the stone of sour cherries on the Mahlep tree. The seed is often ground and sold as a powder. You will also see it spelled Mahlab or Mahlepi. While reading up on it on my phone in the middle of the market, I learned that it’s said to have an almond and cherry-like flavor. I was sold. The spice is often used in Mediterranean baking, specifically for breads. 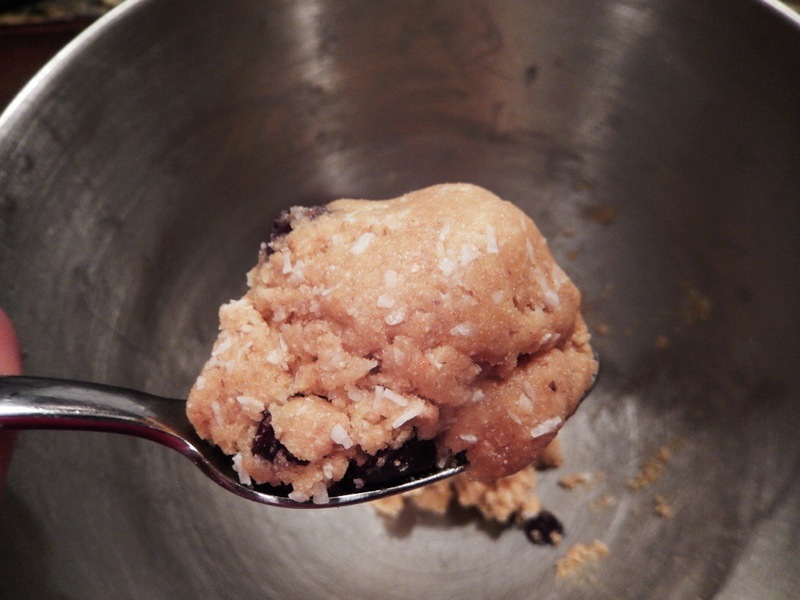 I ran with the whole almond/cherry flavoring, and wanted to make a cookie. First, I had to grind up the Mahlep. I did it in my spice grinder. Very easy! 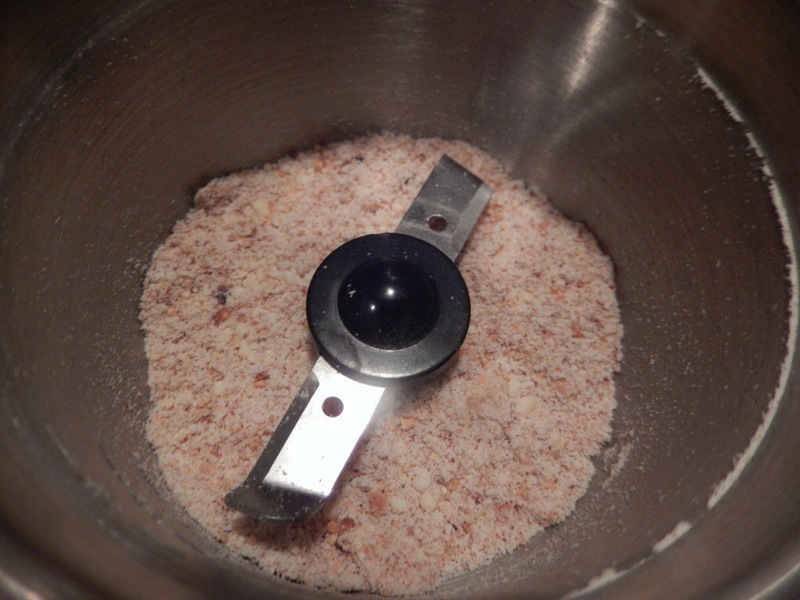 You can use a mortar and pestle. 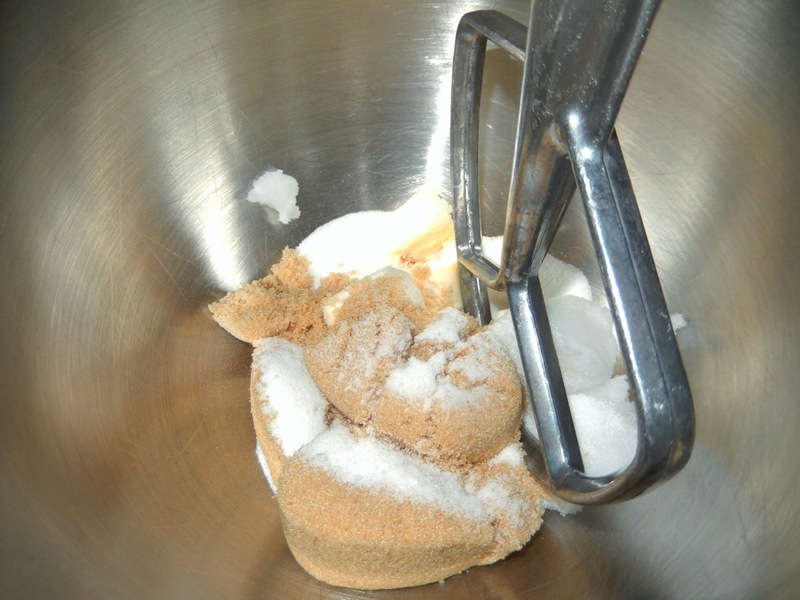 In a mixer, cream together the sugars, the butter, and coconut oil. Add the vanilla and eggs. Mix. Add the flour, baking soda, and salt. Mix. Then, use a spoon to fold in the cherries, coconut, and chocolate chips. 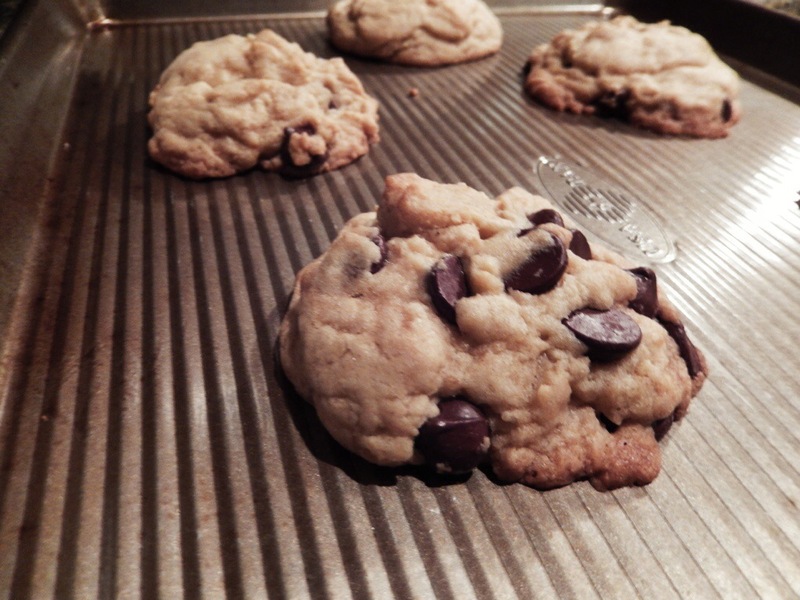 Drop tablespoons of the dough onto an ungreased cookie sheet, leaving about 2 inches between each cookie. Back for 13 minutes, or until the bottom edges of the cookies begin to turn a light, golden brown. I really love these cookies. The whole wheat pastry flour is better for you than all-purpose flour and it adds a tenderness. 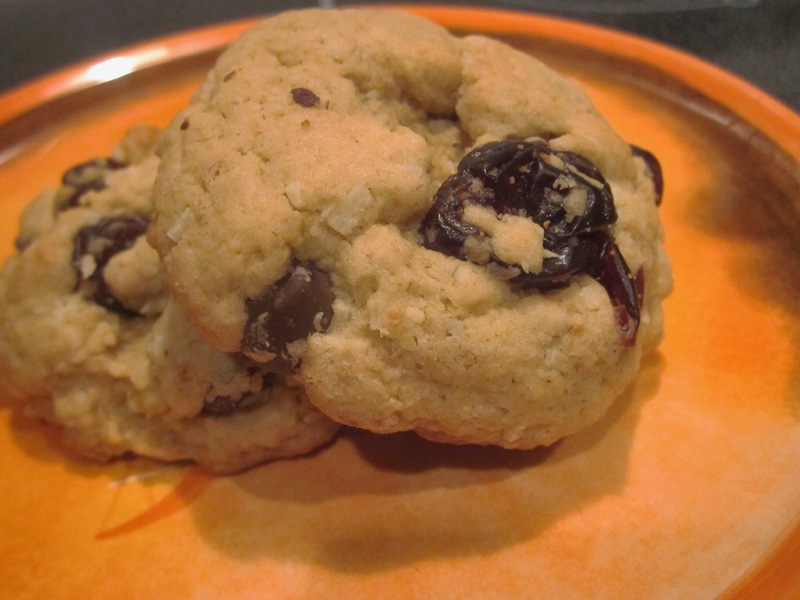 You get different textures from the coconut, cherries, and chocolate chips. And the Mahlep is there, but it’s not overpowering. I think it adds that “little something extra.” It leaves you going, “What do I taste?” It reminds me a little of the effects of nutmeg or cardamom. Here’s the deal, though. 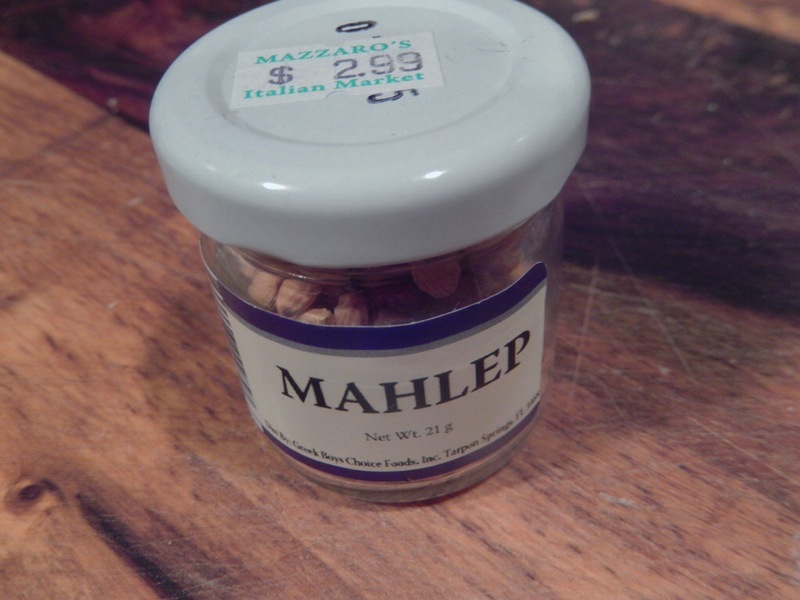 I ate one of the Mahlep seeds and tasted the powder. It has a very bitter flavor on its own. When you smell the seeds or powder, you get almost a rose scent that’s reminiscent of almond extract. The little jar was $2.99, so it was certainly worth it. I can see where it would be great in bread or biscuits. You’d probably get more of the flavor without adding the cherries/coconut/chocolate, but I did that (because I love them!) because I was expecting notes of almond and cherry from the Mahlep. This would be a fun ingredient in Christmas baking. You can get Mahlep on-line. And of course, coconut oil is EVERYWHERE. It has been around for a very long time, but it only started getting good attention in the last few years, making it look like a fad. Tip: If you have Big Lots nearby, check the food section for great bargains. I got big bags of unsweetened coconut (which is REALLY hard to find) and whole wheat pastry flour for good prices. And yes, they were both well within their expiration dates. And no, this is not a paid endorsement. In fact, Big Lots has no idea I exist. Frying pineapple? Wow, never thought of that. I must try those cookies too. Thanks for being a great culinary food guide!! !